Now, I can tell what you're thinking: 'wow, this guy has taken a lot of pictures of his own face'. Yes, that's true. But you may also be thinking 'well, I'd quite like to do some cabaret too'. Luckily I can help you there. 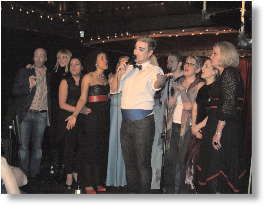 For the past 2 years, cabaret impresario Paul L Martin and I have run the Singers Cabaret Workshop an intensive annual 7 day course of workshops leading to a showcase for industry professionals. The course was borne out of our desire to create an intensive course specifically designed for professional performers to explore the art of cabaret and the demands the form places on a performer. We wanted a course that would be more than just a masterclass situation of working on song presentation and delivery, although that would be incorporated. The course was, and is, unique in the UK and I could not be more proud of it. For more information and to read the testimonials from previous participants, go here.